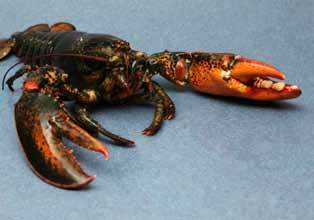 Caught in the icy cold waters of the North Atlantic Ocean, Canadian lobster is known throughout the world. Our hard shell Atlantic Canadian lobsters come from one of the most lucrative lobster areas in Nova Scotia, on Canada’s east coast. Caught using wooden or wire traps by local independent harvesters, our lobsters are great tasting and have high meat content. Sustainability is very important to the livelihood of the harvesters and the future of the stock. Our lobster area has very strict and conservative sustainability measures, including trap limits, closed seasons, escape mechanism for undersized lobster, a large minimum size and no canners or egg bearing females allowed to be harvested. We buy direct from harvesters and hold the lobster at our 50,000 lb capacity pound where we ship daily during the season.